If you have to ask how much it costs, you definitely can't afford it. It's not every day you see a Pagani. The boutique Italian hypercar manufacturer has been in business since the '90s, but their production numbers remain relatively low compared to the likes of Lamborghini and Ferrari. One particular Pagani that doesn't get spotted in the wild all that often is the ultra-rare Zonda Barchetta, and its no surprise. The work of art costs €15 million – note the absence of a decimal place – which translates to about $17.6M at current exchange rates. Naturally, there's only one man who should really be driving this car, and its the man who put it through its paces at Goodwood last weekend – company founder and all-round motoring god, Horacio Pagani. The Zonda Barchetta is basically the demon lovechild between the Zonda 760 series, and the Huayra BC. Its AMG V12 puts out 789 horsepower, and that's mated to a proper old-fashioned six-speed manual with three pedals and a stick and everything. not like these modern cars that they have now. Make no mistake, this is actually a modern car though. Suspension is four-wheel independent double wishbones, upper rocker arm with coil springs and adjustable Öhlins shocks, and an anti roll bar, while the brakes are beefy 380 mm, ventilated discs all round, with six-piston callipers at the front, and four-piston calipers at the rear. 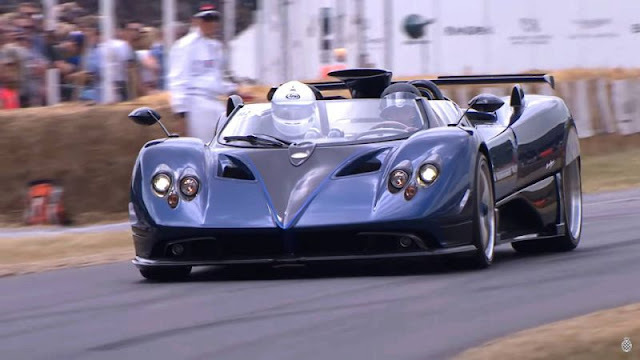 0 Response to "Watch The Rare Pagani Zonda HP Barchetta Climb The Goodwood Hill"